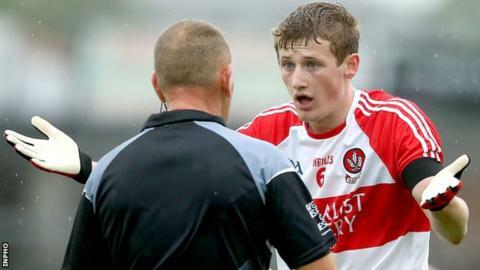 Derry football boss Brian McIver lambasted the performance of referee Conor Lane as he quit after his team's All-Ireland Qualifier defeat by Galway. McIver, who was appointed Derry boss in September 2012, appeared most infuriated by the referee's decision not to award a 61st-minute penalty when Derry were 0-11 to 0-7 down. Derry appealed that Cailean O'Boyle had been bundled over in the small square as he attempted to reach an Eoin Bradley hand pass but replays suggested Lane had made the correct decision. Within 30 seconds, the ball was in the Derry net at the other end as Danny Cummins blasted to the net after running upfield and exchanging passes with Liam Silke. "The penalty decision was a six-point turnaround," added McIver. "He's a referee from Cork. He could have seen it in Cork. "Everything in the GAA over the last 20 years has moved forward immensely except the standard of refereeing. "(They scored) Eight points in the first half and seven of them frees and three of them moved in. "How they hell do you not argue with it when there is hardly a hand put on one of them? "There is no heat of the moment in this. That's the worst refereeing performance I've ever seen in my life." Lane's first-half black carding of accomplished Derry defender Brendan Rogers did look extremely harsh. And Derry were annoyed by a number of Lane's other calls including his decision on two occasions in the first half to play the five-second advantage rule which resulted in two converted frees for the Tribesmen. Galway appeared to be gifted another crucial point by Lane when the scored was 0-8 to 0-7 in the second half after Cummins appeared to be legitimately crowded out by a trio of Derry defenders. But while Derry can point to several questionable decisions, they were only able to score three points in the second half when playing with a strong wind advantage. Galway had been able to notch eight points in the first half and that told the difference in class and nous of the two attacks. Nearly half of Derry's scores came in the opening 10 minutes of play as Eoin Bradley's superb immediate score was followed by points from Benny Heron and Daniel Heavron. But Galway finally started to make use of the elements as fives Gary Sice frees and a placed ball from Paul Conroy helped them move 0-6 to 0-3 ahead. Sice's fifth free came by dint of the advantage rule after his initial goal attempt had been kicked wide. The advantage rule then helped Conroy to his second successful free on 30 minutes although Derry fought back to cut Galway's lead to 0-8 to 0-5 at the break. By that stage, Rogers had been black carded after he only appeared to barely brush a Galway attacker who fell to the turf in response. However, Derry looked in reasonable shape at half-time with the wind advantage to follow and that sense increased as Heavron and O'Boyle kicked scores to cut Galway's lead to one by the 43rd minute. Lane's harsh call against the Derry defence handed Sice has sixth point in the 47th minute and the lead was 0-11 to 0-7 by the hour mark as man of the match Gareth Bradshaw contributed his second score. Within a minute, the game was put to bed as Cummins found the net after Derry's penalty shout at the other end moments earlier. Galway: B O'Donoghue, J Duane, 3. F Hanley, C Sweeney, L Silke, G O'Donnell, G Bradshaw, 8. F O Curraoin, T Flynn, G Sice, P Conroy, M Lundy, 13. P Ó Gríofa, D Comer, D Cummins. Derry: T Mallon; O Duffy, C McKaigue, D McBride; L McGoldrick, B Rogers, SL McGoldrick; N Holly, F Doherty; B Heron, M Lynch, E Lynn; D Heavron, Eoin Bradley, C O'Boyle.